I'm so excited! The sampler is done and off the loom. I finished weaving just before dinner and AJ couldn't wait to check out the fabric. I'm just grateful she waited until it was off the loom. I put on a 3 yard warp but didn't get as much fabric as I'd hoped because a couple of the back ties broke as I neared the end. I was close enough to finished that it wasn't worth doing a real fix - I just tied the loose threads to the back beam and weighted them down so I could get in the last few picks. This is green, light brown, and dark brown Fox Fiber organic cotton. The fiber isn't dyed, it's naturally grown that color. This section is about 10" wide by 22" long. 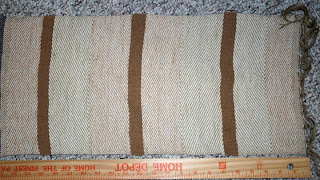 The dark brown is a tabby border, with the other 2 colors in an opposing 2/2 twill. (Greek to you? Basically, one section leans one way \\\\\\ and the next section leans the opposite direction ////// . Makes a neat pattern. ) The colors are supposed to get darker when I wash them. I'm looking forward to seeing that, along with how much shrinkage there is. 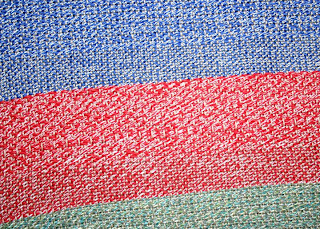 This one is the cotton/poly towel fiber. It feels very stiff, even off the loom. I hope it will soften up when it's washed. 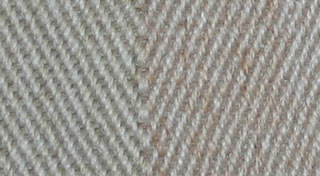 Each stripe is a different 2" twill pattern with a 1" plain weave border. If it doesn't shrink too much, it should be an OK size for a towel. A little narrow at 10" but the length is good. Tomorrow I'll stitch each end, cut the sections apart, and wash the whole thing. Excitement!